This week's party is brought to you by two sponsors!! Baby A and Baby B!! Now, before all of Michelle's close friends freak out, this isn't Michelle's announcement. 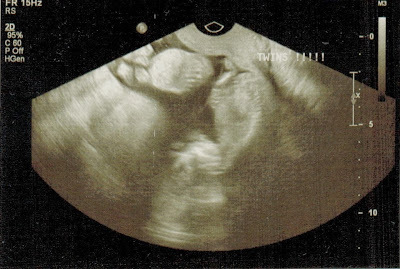 This is actually Miranda :) I've been debating about when to spill the beans, but I just couldn't wait any longer! We've waited so long to add to our family (our son is 5), so we're absolutely thrilled (and a little freaked out) with the addition of two more. Hopefully we'll be able to find out at our next appointment if we're having boys or girls - or both! So, any other moms of twins out there with words of encouragement or support or tips and tricks?!? I'm sure I'll need them all over the next couple of months years. It All Started With Paint made these spooky Halloween decorations! 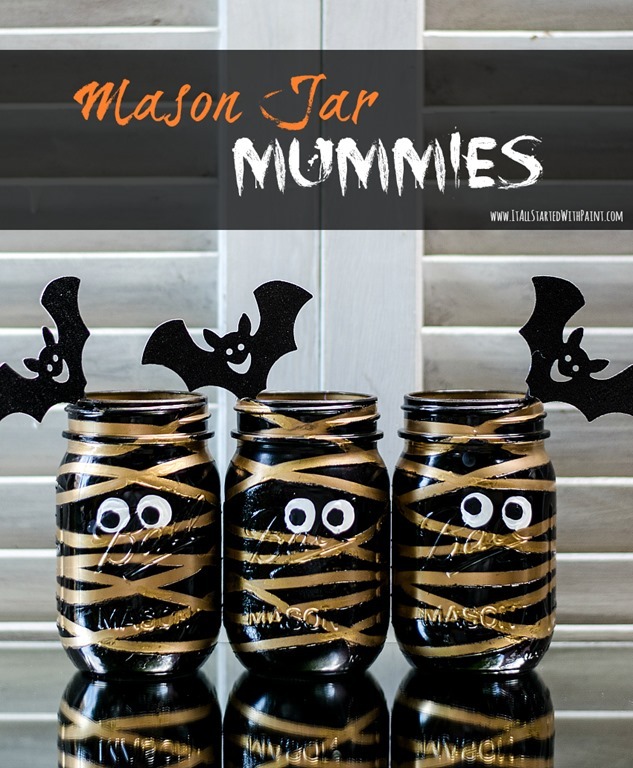 Aren't these Mason Jar Mummies so cute!? It's official. Fall is here! Bring on the pumpkins and sweaters! Check out the Fall Categorically Crafting Party for some fall inspiration! There are so many awesome Halloween crafts floating around in Blogland. Come link up your Halloween crafts, décor, and food ideas at our Halloween Categorically Crafting Party this Friday! Thanks so much for the fabulous party! And congrats on your twins, Miranda! I have soon-to-be seven-year-old twin boys. You are going to LOVE it!! You'll be extremely sleep-deprived for the first bit, but you are with any baby. There's nothing quite like twins. It was hardest in the beginning because I wasn't sleeping, but it just gets easier and better as times goes on. They always have a playmate, and it's priceless watching them interact, even from a young age. I'm so, so excited for you!! Enjoy your day! Wow, great news!! Congrats!! I am an identical twin and love it. What a blessing!! thanks for hosting this lovely party! CONGRATS on your excited news, Miranda! Thanks for hosting a great party & I hope you have FUN rest of your week! How exciting to be having twins! I'm a twin and my sister and I are the very best of friends. Hope you're having a great week and feeling ok! I'm a twin momma too! My boys are 4. It will change your life more than you could ever imagine! Just prepare yourself. Its going to be REALLY hard at first! Try to recruit as much help as you can. The good news is, the older they get, the easier they get. Now they are older, its really nice for them to have a playmate. They don't need so much of my attention. Also, I recommend joining the forum on twinstuff.com. It was really helpful to have other MOMs to ask questions. Singleton moms just don't understand sometimes. Thanks, Danielle! :) I'm trying really hard to remember that and take it easy. Bed rest is NOT on my to do list this pregnancy. It is so much harder making two human beings than making one. I worked in a retail store up until the day before I had my son, but there's no way I could do that this time around. I can barely do all of our laundry in one day now! My hubby and I are both twins & I always wanted to have twins myself! You are going to have sooo . . . much fun! Congrats! Thanks for hosting! I linked up some spray painted candy corn wine bottles. Twins! How exciting! I always thought that would be so fun, but they didn't run in our families. Thanks so much for hosting and congratulations on your upcoming additions! So exciting!!! My twin girls are now 12! I loved having twins. It's so fun to see what is personality and what is just being what ever age they are!! Just try to enjoy each stage, don't try to just get through a hard stage cause it will be gone all too sooon!!! Congrats Miranda! So happy x2!